The Rock 'n Roll Litter! We had much to be thankful for this past Thanksgiving. Nine beautiful puppies born the day before Thanksgiving; 5 boys and 4 girls. Since this breeding was between Remington and Rainey (R&R), we're calling this our Rock 'n Roll litter. We're currently accepting applications from exceptional owners for these beautiful puppies. Meanwhile, we're basking in the sweet smell of puppy breath! Remington is a gorgeous boy with an amazingly sweet temperament. 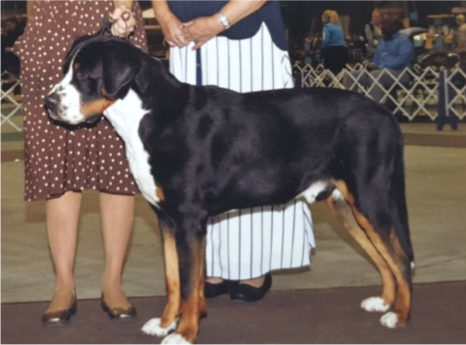 He finished his AKC Championship in only two weekends with 3 major wins and is currently competing for his Grand Championship Title. Rainey is a big, beautiful 2-1/2 year old girl from one of our prior litters, an Oliver granddaughter. She's a very athletic girl with a robust personality who craves lots of loving. Rainey is a registered Therapy Dog. Remi found a job at a young age. A Real Working Dog! Rainey... an exuberant 7 week old puppy!